This three-bedroom with private outdoor space at 44 East 12th St. is listed by Citi Habitats for $10,700 a month. MANHATTAN — Apartment vacancies in Manhattan are the highest they’ve been in nine years, according to a report released Thursday by Douglas Elliman. The vacancy rate hit nearly 2.9 percent in November, up from 2.3 percent a year ago, the report found. Landlords, in response, have been offering more concessions, like a month’s free rent or the owner paying the broker’s fee, so they don’t have to lower rents. The share of new rental transactions with concessions rose to 13.5 percent — nearly three times as much as the 4.8 percent a year ago, the Elliman report noted. 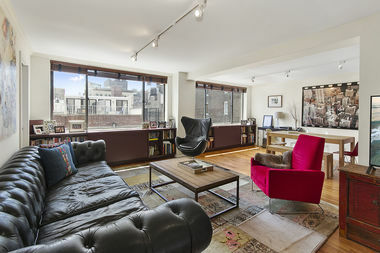 An image of a unit at 1 N. 4th Place in Williamsburg, a luxury rental where studios start at $2,772 a month and two-bedrooms start at about $4,000 a month. The building's site says it's offering two months free rent. Manhattan’s median rental price — $3,361 a month — was nearly 4 percent higher from the year before, representing the 21st consecutive month of year-over-year increase, the Elliman report found. Miller doesn’t expect to see big rent drops anytime soon since there is still a lot of “pressure” on the rental market — there’s a “robust” economy as well as tight credit and the potential of rising mortgage rates, which prevent some renters from becoming buyers. But affordability continues to be a big issue, Miller said. 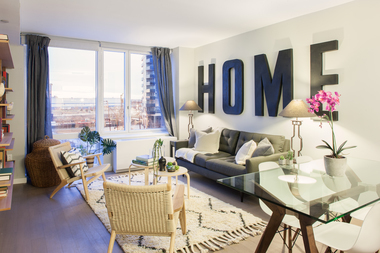 “There is a significant disconnect between owners’ expectations and tenants’ willingness and ability to pay,” Gary Malin, president of Citi Habitats, said in a statement. His firm found that Manhattan’s vacancy rates were highest in the East Village (3.2 percent), followed by the West Village (2.6 percent). “The fact that vacancy rates are the highest in the East and West Villages is strong evidence that for apartment seekers, paying high prices for small spaces no longer adds up,” Malin said. Malin said the “party’s over” for landlords, as inventory has been “trending upward for the past six months,” giving renters more options. “Landlords need to react, and it’s going to take rent reductions and additional incentives to move the needle — especially as we enter the holiday season,” he said. The priciest rents in November were in SoHo/TriBeCa, with a median rent of $4,795 a month, followed by Gramercy/Flatiron with a median rent of $4,075, according to the Citi Habitats report. The least expensive area for Manhattan renters was Washington Heights, with a median rent of $2,000 a month. For neighborhoods below 96th Street, the Upper East Side’s median rent of $2,335 was the lowest. Brooklyn prices slipped ever so slightly, with the rate of price growth for the median rent declining since August, according to the report. For the parts of Brooklyn covered in the Elliman report — North Brooklyn, Brownstone Brooklyn and East Brooklyn — the median of $2,935 a month was 0.4 percent less from the year before. Concessions were also up there. The median rent for the small northwest region, including the new developments in Long Island City, saw median rents jump more than 8 percent from the year before to $2,735 a month, the Elliman report found. But concessions were very popular in this area, too, accounting for nearly half of all transactions. The bulk involved landlords paying the fee, mostly on new developments, Miller noted. New inventory in towers in places such as Long Island City and Downtown Brooklyn are likely taking some of the wind out of Manhattan’s market, noted Luciane Serafovic, who heads up rentals for Douglas Elliman. And while this is the time of year more people are focused on the holidays than finding a new apartment, it’s also the time that renters might score the best opportunities and save some money, she said. “It’s good news for renters,” Serafovic said.